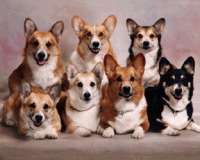 This is THE ORIGINAL CORGI CORRAL! located in GLENNS VIRGINIA. WELCOME TO THE WILD, WILD WEST! HOME OF THE CORGI CORRAL! Yes, we will take a dog back at any time, at any age if for some reason you cannot care for it anymore! Please browse our pages as most of your questions will be answered here! Please note that if you are viewing this site on a phone, it may not present as it actually is. Sometimes photos are not in order, etc. We get several inquiries a day, so answering the same questions over and over is very time consuming. Please go over the website thoroughly to save us time. For other questions, please feel free to email or call. Our phone number and contact form are on the bottom of this page. Page tabs above have drop down menus. Under Home tab: Safe dog food list, Copy of contract, info for flying pups out of state. Cowboys and Cowgirls: photos and descriptions of our breeding dogs. *Prices & Reservations*: Pricing info, reservation instructions, and photo examples of the colors Corgis come in. We hope you'll have a hootin' good time! 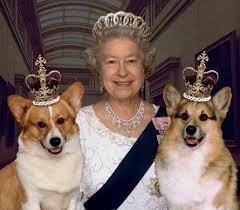 Corgis are VERY entertaining, which is why most of our customers come back for a second or third puppy! Just ask the Queen of England, nobody can have just one! The Puppy Care Page has been updated with some important info! If you just want Corgi information, we'll be glad to help you. Please check out our listings for safe dog foods while you're here. You will find the dog food page link if you scroll over the "HOME" page link above, as well as our contract. OUR PUPPIES: All of our pups are AKC registered, born and raised in our home, never in a cage, but have a crate they like to sleep in inside of their play area so they are used to it. They are loved and cuddled, bathed weekly so they will be used to it, (usually with just a bit of water) but we don't recommend over bathing once you get them home. Always paper trained, first shots, wormed bi-weekly, and come with a health guarantee that also covers genetic defects. We welcome your calls and emails with questions/problems and love getting photos and success stories from our puppy parents, like our AKC Agility Champion pup, "SMART AS A WHIP!" We study and practice Cesar Millan dog training methods so you start with a well behaved puppy. THERE HAS BEEN NO CROSSBREEDING INVOLVED IN GETTING A SMALLER DOG, JUST CAREFUL, SELECTIVE BREEDING OF NICE HEALTHY DOGS, NOT RUNTS. Health: Pembrokes have an average life expectancy of 12-15 yrs. I find 13-17 to be more common when feeding a chemical free diet as suggested in our safe dog food list. Health problems may include: degenerative myelopathy, hip dysplasia, and Von Willebrand's disease if their parents suffered from the same problems. No Corgi Carrying these defects should ever be bred. and tendency to only bark as needed. Most Pembrokes will seek the attention of everyone they meet, and behave well around children and other pets. It is best to socialize them with children, pets and other adults while still young. I give my neighbor's children each a dollar to come and play with the puppies! They can't understand why I pay them for it because they have so much fun, but I tell them it is very important work! Contact Form AGAIN: PLEASE GO THRU THE INFO ON OUR PAGES BEFORE ASKING FOR PRICES ETC. AS THEY ARE ALREADY LISTED FOR YOU!